Darnell Nurse scored 55 seconds into overtime to lift the Edmonton Oilers past the Vegas Golden Knights 3-2 on Saturday night. The Edmonton Oilers have done something no other NHL team has this season: beat the Vegas Golden Knights twice. 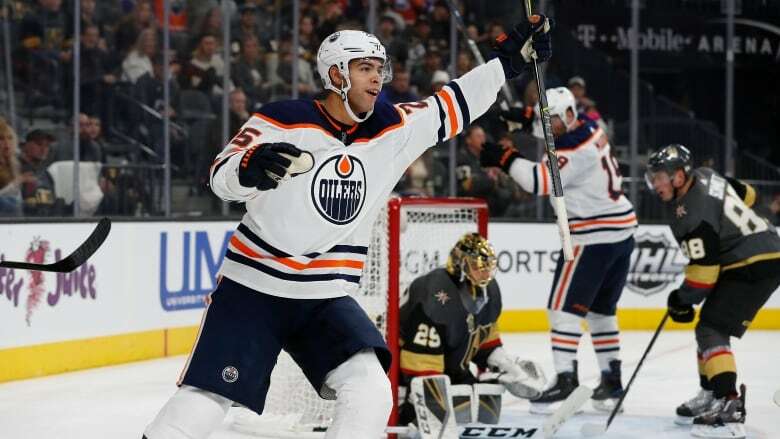 Darnell Nurse scored 55 seconds into overtime to lift the Oilers past Vegas 3-2 on Saturday night. Edmonton also handed the Golden Knights their worst loss of the season, an 8-2 shellacking on Nov. 14. Patrick Maroon and Drake Caggiula also scored for the Oilers, and Cam Talbot made 34 saves. Caggiula assisted on the winner after leading a 2-on-1 break against defender Shea Theodore and finding the streaking Nurse in front of the net. "I saw the puck come over the blue line, and Draker had it and we saw one D, so I just took off and he made a great play to the middle and all I had to do was shoot it hard," Nurse said. William Karlsson and Reilly Smith scored for Vegas, while Marc-Andre Fleury stopped 27 shots. Vegas, coming off its bye week, was playing for the first time since Jan. 6 when they beat the New York Rangers 2-1. The loss was just its second in 12 games, while it dropped to 18-3-1 at home. "Tonight was all about having five days off," Vegas coach Gerard Gallant said. "We weren't sharp. We didn't play our typical game. We still played OK, but we weren't as sharp as we could've been. Am I worried about it? No. I think some of the bad stuff we did, some of the habits, is from the five days off and having one day of practice." The Oilers, meanwhile, were playing for the second time in two nights after a 4-2 win in Arizona. Edmonton, which is 3-6-1 in its last 10 games, begins its bye week Sunday. "We wanted to go into the break with two wins within our division and go in feeling good about ourselves and have the opportunity to rest up and get back at it in five," Nurse said. Edmonton got on the board first, when Nurse's pass caromed off Maroon's left skate and slid beneath Fleury's pads. Connor McDavid assisted. It didn't take long for the Golden Knights to respond, as Smith picked up the puck behind the net, skated around long enough to shake McDavid and then skated right up to Talbot before going top shelf for his 12th goal. Deryk Engelland was credited with an assist to tally his 100th career point. Vegas' second goal was set up nicely by Smith, who laid a big hit on Edmonton's Kris Russell, allowing Jonathan Marchessault to skate free with the puck and set up Karlsson in front of the net for the one-timer. Karlsson, who many believe was snubbed from the Pacific Division All-Star team, scored his 23rd goal of the season, fifth-highest in the league. Caggiula tied the game for the Oilers, who displayed excellent passing on a 3-on-1 break in transition. Maroon and McDavid assisted on the goal. It was McDavid's 200th career point, in just the 173rd game of his NHL career. He is the fourth-quickest active player and third youngest active player to reach 200 points. The Golden Knights had several opportunities with a man advantage, but were 0 for 6 on the power play. The Oilers, whose penalty kill ranks last in the NHL, has the third-best road percentage when short-handed. "It's astounding the difference in numbers, but to hold a team like that to 0 for 6, that's the game right there," Talbot said. "If they pound one in in the power play, game's over. Give a lot of credit to the PK, I don't think we gave up a lot of shots, maybe one per kill, that's a pretty good number against a team like that."